The 2019 AFL season has officially kicked off (pun intended), with the first round of games played last weekend – and boy, did the SUNS put on quite the performance! Narrowly missing out on a win in their first game against St Kilda by just one point, the SUNS gave Gold Coasters – who were no doubt watching the game live at home – a lot to look forward to this season. The SUNS are accepting the challenge in 2019 and making no excuses. They know their actions will define them, and this weekend’s home game at Metricon Stadium will certainly be their time to shine. 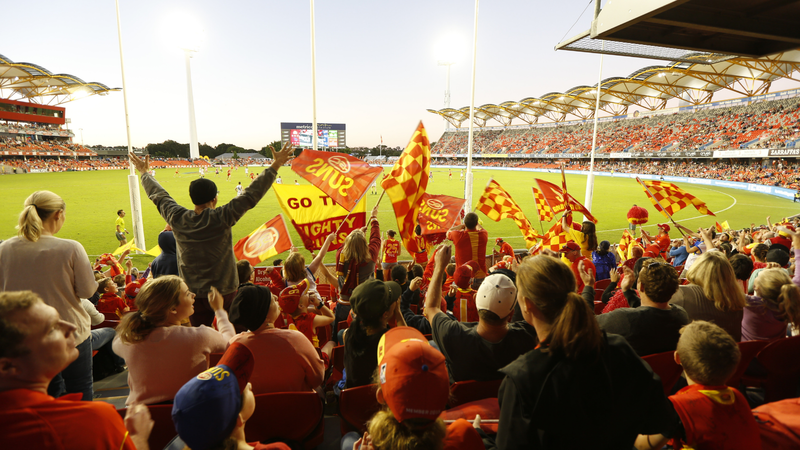 With the sun on their backs and the support of the entire city – games at Metricon always attract huge crowds – the Gold Coast SUNS should definitely be looking forward to Sunday afternoon’s match-up against Fremantle. And spectators should get excited, too. Family fun is the focus of SUNS’ home games at Metricon Stadium, and there is always plenty to see, do and taste while you watch the game live. Expect family-friendly fun with a rock climbing wall, hair braiding, inflatable sports equipment and footy-focused activities. Plus, you can bring your kids along for FREE on Sunday afternoon! When you buy an adult reserved ticket, up to 4 kids under 15 go free – that’s just $25 for one adult and up to 4 kids! There’s also delicious food from the on-site food trucks, and you can score freebies from wandering characters. The haven team are excited for some new game experiences, seeing the SUNS Dance Squad made up of local Gold Coast kids and checking out the new SUNS Surf Club with full size lifeguard tower. Be sure to don your red and gold to get into the spirit! Kids activities start from 2pm, and the game starts at 3.40pm. Head to www.goldcoastfc.com.au for all of the details. WIN // haven has teamed up with the Gold Coast SUNS to giveaway 4 x Reserved Seat Tickets to see the Gold Coast SUNS take on the Fremantle Dockers this Sunday, March 31, for a 3.40pm kick-off at Metricon Stadium. Get your entries in quick, competition ends Saturday March 30 at 9am. Only the winner will be notified and tickets will be sent via email. Good luck!